I believe that Catherynne M. Valente's Fairyland books are a big part of the reason I've fallen back in love with middle grade (books aimed at readers ages 8-12... what I would have called 'Juvenile' growing up) fiction. I adore the whimsy inherent in Valente's descriptions, the inventiveness of her settings, and the overall magic of her stories. I think these books are new classics, and I can't wait to have a set of them all lined up on my shelf together, to read over and over, whenever I need a bit of the fantastical to inspire my day-to-day life. While I haven't read the third book in the series yet, I read, reviewed and loved The Girl Who Circumnavigated Fairyland, The Girl Who Fell Beneath Fairyland, and the short story The Girl Who Ruled Fairyland (all titles shortened for convenience, you understand). 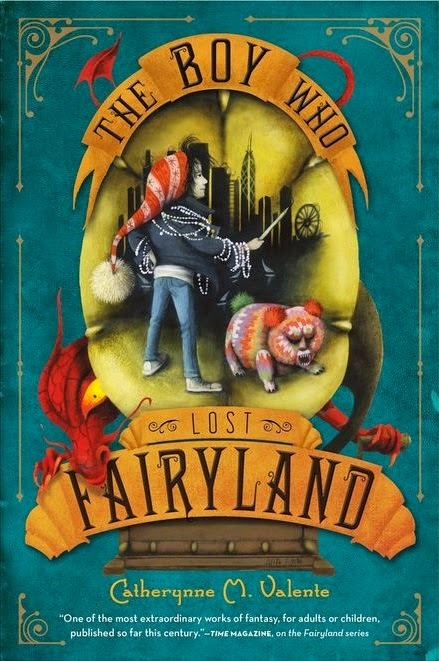 Thus it should come as no surprise that I can't freaking wait for the latest in the Fairyland saga, The Boy Who Lost Fairyland. It will be released by Feiwel & Friends (Macmillan) on March 3, 2015. When a young troll named Hawthorn is stolen from Fairyland by the Golden Wind, he becomes a changeling – a human boy -- in the strange city of Chicago, a place no less bizarre and magical than Fairyland when seen through trollish eyes. Left with a human family, Hawthorn struggles with his troll nature and his changeling fate. But when he turns twelve, he stumbles upon a way back home, to a Fairyland much changed from the one he remembers. Hawthorn finds himself at the center of a changeling revolution--until he comes face to face with a beautiful young Scientiste with very big, very red assistant. Time magazine has praised Catherynne M. Valente's Fairyland books as "one of the most extraordinary works of fantasy, for adults or children, published so far this century." In this fourth installment of her saga, Valente 's wisdom and wit will charm readers of all ages. I can't remember the last time I read a middle grade book and I've never heard of this author. It looks really good! Here's my Waiting on Wednesday! My WoW, and when you hop over, come check out my Two Year Blogoversary Giveaway!